While the immigration debate struggles onward in Congress, a second federal judge has blocked the Trump administration’s effort to sunset the national program that provides protections to undocumented people brought to the United States as children. Following a ruling last month by a judge in San Francisco, U.S. District Judge Nicholas Garaufis in Brooklyn ruled Tuesday that the Deferred Action for Childhood Arrivals (DACA) program cannot end March 5, as the Trump administration had proposed when Attorney General Jeff Sessions announced plans to end to program last September. Garaufis wrote (pdf) in his decision that the Trump administration “indisputably can end the DACA program,” but concluded that they have not “offered legally adequate reasons for doing so,” and issued a preliminary injunction that aligns with the one issued by the judge in San Francisco. Josh Rosenthal, an attorney with the National Immigration Law Center (NILC), explained the ruling in a series of tweets, noting that while “anyone who had DACA in the past must be allowed to apply for DACA on the terms that were in effect before the Sept. 5 announcement… this injunction does not allow new applicants to apply,” and that the decision is particularly important as the U.S. Supreme Court considers this week whether to hear the San Francisco case. Make the Road NY, which joined with the NILC in filing the suit, vowed to continue the fight to protect Dreamers, as DACA recipients are often called, referring to the DREAM Act that’s been debated in Congress since 2001. #BREAKING: HUGE WIN for our #Dreamers in federal court! We and @NILC_org just won a preliminary injunction blocking Trump’s racist decision to end #DACA. 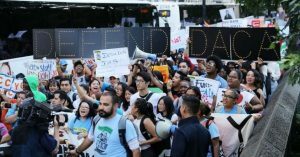 DACA renewals must continue nationwide. We will continue to fight in court, in the streets, and in Congress for #DreamActNow. The ruling comes as lawmakers on Capitol Hill are struggling to start discussions about how to provide a long-term legislative fix to DACA considering the hard-line positions of the Republican legislators and President Donald Trump. “The Senate’s much-anticipated immigration debate stalled on Tuesday with party leaders feuding over how to even begin,” Politico noted. Despite delays, Majority Leader Mitch McConnell (R-Ky.) has determined that debates on the matter will be contained to only this week. While McConnell has attempted to hold floor votes on an amendment from Sen. Pat Toomey (R-Pa.) about sanctuary cities—which has been a target for both Republican lawmakers and the Trump administration—Democrats have objected on the grounds that the amendment has nothing to do with Dreamers or Republicans’ demands to increase border security alongside any legislation that addresses DACA.